Earlier today, a trailer dropped for Victor Frankenstein and I couldn’t have been more intrigued and then more puzzled. Starring Daniel Radcliffe of Harry Potter fame and James McAvoy who played Charles Xavier in X-Men: First Class, Radcliffe plays the amiable and not-at-all hunchbacked Igor while McAvoy takes on the role of Victor Frankenstein, a scientist who seeks to create life from dead flesh. It’s your typical “we’re going to put a spin on the characters while trying out best not to emulate Sherlock” kind of deal as Igor tries to deal with the impulsive Frankenstein. The trailer is an action-packed filled with zombie monkeys, explosions, electric shocks, subtle humour, more explosions, and very little of the monster itself. What’s confusing is that there are two very different trailers out for the movie right now. One (the first clip) paints the film as a bit of a darker film perhaps discussing more of the ethical dilemmas of creating life while the other (the second clip) has Radcliffe and McAvoy joking around at the start before launching into a meh kind of trailer. Anyway, the movie looks… ok. It has a good cast of characters who are believable in their roles and funny to boot. However, like most films that feature Frankenstein’s monster it seems like it’s going to miss out on the deeper meaning of the creature’s existence. What will likely happen in the film is that in the first hour or so they will get to the point where the monster is alive and escapes, they will track it down, Victor will get hurt, Igor will step in, and it will turn out that a smart part of his mind has given the Monster a conscience which will help it escape the big city before the police murder it. The monster will then try to leave only to be caught and will end up sacrificing itself for its fathers dying in a fiery explosion of some kind that will make the audience tear up. That’s just my guess, but I haven’t really seen any modern films that have done anything really nuanced with Mary Shelley’s masterpiece and to be honest that’s probably for the best. Frankenstein, or the Modern Prometheus opens on a ship with a man named Robert Walton writing a letter to his sister. While on the ship, they pick up a passenger who was stranded far in the north named Victor Frankenstein. Victor tells Robert his story from his days as a student to his eventual creation of the monster. Somewhere in the middle of that story, we begin to follow the life of his creation through the monster telling his life’s story to Victor. It’s a literary technique called mise en abyme or a frame within a frame. It’s typically used to foreshadow events, but also creates an unreliable narrator in the case of Robert Walton. Can we trust that the story Robert is telling us about Victor who told us about the creature’s story is true? Well we learn the truth when Victor finally finding his creation only to die before meeting him again. “That is also my victim!” he exclaimed. “In his murder my crimes are consummated; the miserable series of my being is wound to its close! Oh, Frankenstein! Generous and self-devoted being! What does it avail that I now ask thee to pardon me? I, who irretrievably destroyed thee by destroying all thou lovedst. Alas! He is cold, he cannot answer me.” His voice seemed suffocated, and my first impulses, which had suggested to me the duty of obeying the dying request of my friend in destroying his enemy, were now suspended by a mixture of curiosity and compassion. I approached this tremendous being; I dared not again raise my eyes to his face, there was something so scaring and unearthly in his ugliness. I attempted to speak, but the words died away on my lips. The monster continued to utter wild and incoherent self-reproaches. At length I gathered resolution to address him in a pause of the tempest of his passion. “And do you dream?” said the daemon. “Do you think that I was then dead to agony and remorse? He,” he continued, pointing to the corpse, “he suffered not in the consummation of the deed. Oh! Not the ten-thousandth portion of the anguish that was mine during the lingering detail of its execution. A frightful selfishness hurried me on, while my heart was poisoned with remorse. Think you that the groans of Clerval were music to my ears? My heart was fashioned to be susceptible of love and sympathy, and when wrenched by misery to vice and hatred, it did not endure the violence of the change without torture such as you cannot even imagine. I have a feeling that this new movie won’t be getting into this kind of depth with the monster and his creator. There’s nothing to say, so far, that it won’t have a little bit of depth, but something tells me that the action-starved masses certainly wouldn’t like a Frankenstein movie done with Mary Shelley’s original tale in mind. People would rather do away with the ethical and moral implications of creating life, the trials of the monster finding his identity, and the existential anguish caused by his creator’s death for something flashy and ridiculous starring these two blokes. 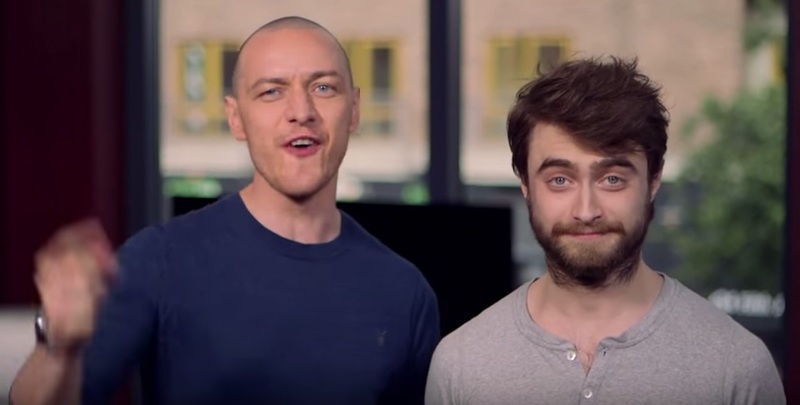 The definition of blokes, or a really young Voldemort and a Harry who has let himself go. Just look at any other modern interpretation of Mary Shelly’s book. Well, I’ll just show you. Actually the Van Helsing version of the monster is kind of cool, but it still misses the point. Frankenstein’s monster in the book is simply a well-spoken being who was born into this world a babe in the woods. He had to learn and grow on his own without the nurturing guidance of parents, and the society around him made him a monster. In popular culture, there is only one Frankenstein’s Monster. It’s a snarling beast that can speak and can reason, but ultimately dies a fiery death at the hand of its creator and is never once put in a good light throughout any movie. He’s evil. Whoa that was actually kind of messed up, so yeah get your pitchforks out for Robert Dinerostein; however, the point still stands that there isn’t really a good depiction of the monster in any film. It makes me fear that this new film will simply do the same thing that’s been done over and over to the monster throughout the history of film. It will cast the monster as an evil beast with a single moment of redemption before dying a fiery death. It’s like a really small Godzilla in that we feel really bad when it’s dying, but we don’t feel a goddamn thing while it struggles to stay alive. This entry was posted in Film, Science Fiction & Fantasy and tagged Daniel Radcliffe, James McAvoy, Mary Shelley, Victor Frankenstein. Bookmark the permalink.